2xIPA is a full bodied, unfiltered Double IPA that is brewed with ample amounts of premium Pacific Northwest Cascade hops and is paired with a rich blend of 2-row Pale and Crystal malts. Following fermentation it has been heavily dry hopped with Centennial hops giving this bold brew a big west coast nose. 2xIPA delivers a huge amount of piney, floral, and citrusy hop aroma and flavor from start to finish that is moderately tempered by a sweet malt backbone. If you are a “hophead”, this one’s for you; big, chewy, resiny and fragrant. At 8.3% alcohol by volume and 85 IBUs, Propeller 2xIPA is not for everyone… It is a TRUE hop bomb, for TRUE hopheads! 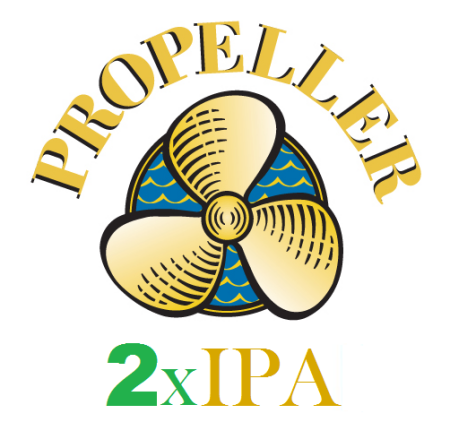 Propeller 2xIPA will be available exclusively in growlers at the Prop Shop retail store while supplies last. The One-Hit Wonder Series will continue with a new beer released around the beginning of each month until the busy summer season begins.